This should be final post for 2016. I hope that my travel blog has been interesting and filled with much excitement. Before I go into my final post, I want to talk about a snack that I got from Arashiyama. It is a mochi and it tastes real good. Unfortunately, it was not able to last for more than a day. I had to finish it up at the hotel despite having a heavy dinner. Lol. Actually I threw away half of it, was not able to finish it. Do give it a try and look for it if you are at Arashiyama. Remember that I said that Kyoto is a place where bus is a much friendly transport than the train? This is one of the location where you have to take a bus to go to. I was lucky to board the second bus after missing the first one as there was a lot of people. Plus the rain is not helping much too. I was surprised that I was not treated to a huge crowd when I got there. Probably the rain helped reduce the number of people visiting the pavilion. 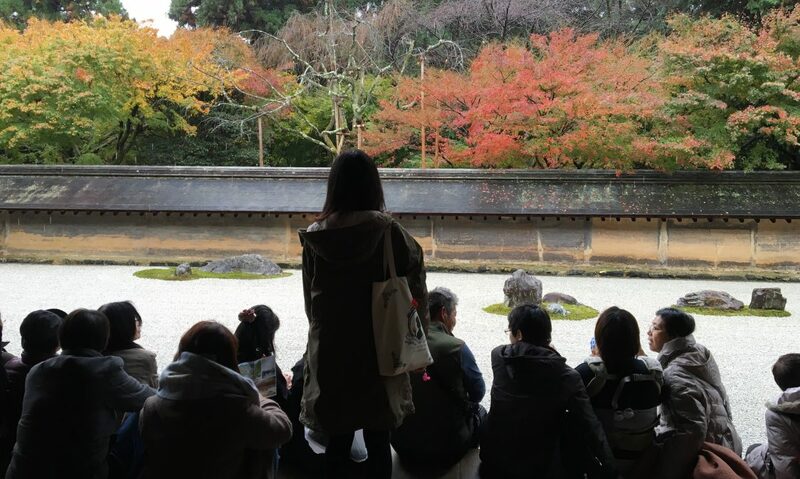 Kinkakuji is considered a zen temple where the top 2 floors are covered with gold leaf. This temple was formally a retirement villa of the shogun Ashikaga Yoshimitsu. According to his will, this villa became a zen temple after his passing in 1408. This villa was inspired by Ginkakuji, which was built by Yoshimitsu san’s grandson. By following the tourist path, you will get to see a status where people try to toss coins into a cup. It is said to bring luck if you are able to throw the coin in. I tried with 100 yen and it was way off the cup. One last view of the Golden pavilion from the top. I really hope everyone has a great year and with the brand new year within reach, I hope to see a few new faces, meet up with old friends and probably go on a date.